C1: hydrocarbon synthetic wax with exceptional resistance to cold snow crystal abrasion. This micro-granular powder wax is easy to iron and scrape. Use this wax in very cold snow and lower relative air humidity to ensure the best glide. 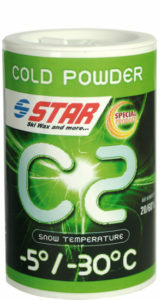 C2: very hard powder wax with the addition of fluorocarbons providing excellent results in the very cold abrasive snow with higher relative air humidity. C2 should be used as the final layer for very cold conditions, especially very cold artificial snow that contains an elevated content of water inside the snow crystal. MAP200: synthetic base mixed with micro granular graphite for all warm snow conditions. 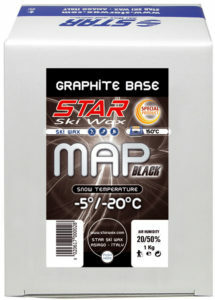 The graphite additives help restore the base and improve the hold of other waxes Periodical waxing with this product keeps bases black and shining and reduces wear. 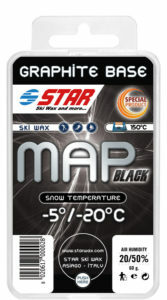 MAP BLACK: graphite base was designed to prep bases for cold and abrasive snow especially for long distances. 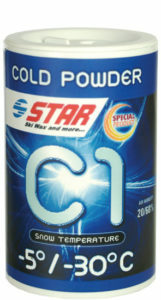 For cold dry snow conditions MAP BLACK can be used alone or covered with C1. 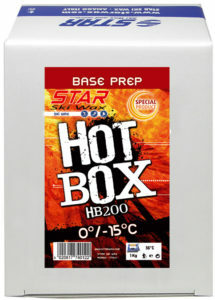 HOT BOX is a mix of natural and synthetic waxes specifically designed for saturating ski bases in a temperature controlled room. 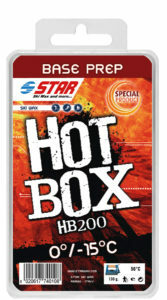 This low viscosity wax liquefies at 55°C, and therefore guarantees excellent base penetration. 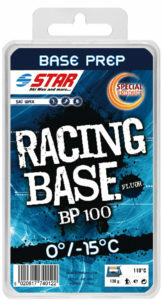 RACING BASE is a new revolutionary product developed for protecting and preparing ski bases. This mix of synthetic wax and short chain fluoro polymers drastically reduces oxidation of ski bases caused by contact with atmospheric agents. 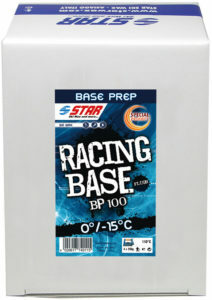 BP100 is an excellent cover wax after stone grinding or during periods of inactivity.